People of this sign usually say little and possess great wisdom. They are often selfish and a bit stingy, but they have a lot of sympathy for others and will go to great length to try to help those less fortunate. By nature, they tend to over do things since they have doubts about the judgment of others. They are determined in whatever they do and hate to fail. 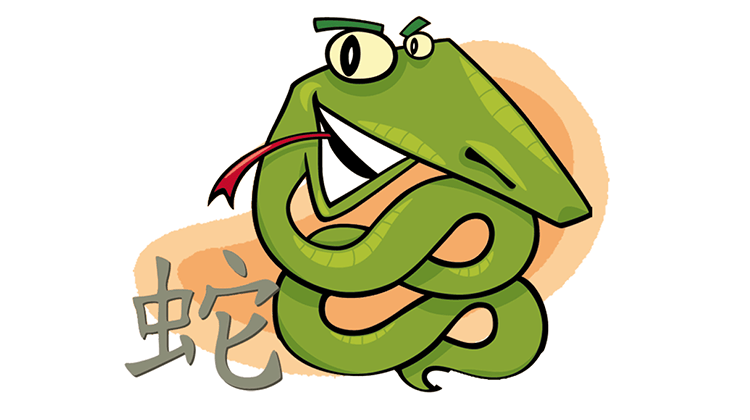 The Snake is the master seducer of the Chinese Zodiac. Always well-liked, Snakes are sociable yet introverted as well as intuitive and blessed with a keen aptitude for business. Although Snakes may not consider money that important, their luck and tendency to be a bit tight with their purse strings ensure they will have more money than they need. Snakes are far more mentally active than they are physically. They tend to analyze events before joining in. Overall Snakes have reserved dispositions and probing minds that make intellectual pursuits far more attractive to them than physical activity. The best companions for persons born in the year of the snake are the reliable "ox," fearless "rooster," and heroic "dragon." Such a person can also get along well with people born in the year of the mouse, rabbit, sheep and dog. However, they should avoid the challenging "tiger," and keep only ordinary relationships with the impulsive "horse," who is hard to deal with. The cunning "monkey" will challenge him. Yet people born in the year of the snake can coexist with each other peacefully. However, the sophisticated and tactful "snake" shares no common point with the simple and honest "pig". Snake and RAT: A good degree of attraction. Will cooperate successfully to achieve common goal. Satisfactory relationship possible. Snake and OX: Good match. Will understand each other and relate extremely well. Could form profitable and lasting ties. Snake and TIGER: Conflicts and ill feeling. Mutually suspicious of each other. Cannot relate to one another. Indifferent or unsympathetic at best. Snake and RABBIT: Civil and congenial ties. Will work together to accomplish mutual goals. No special attraction but no animosities. Snake and DRAGON: Sympathetic to each other. Will cooperate successfully. A compatible and fruitful union resulting in mutual benefits. Snake and SNAKE: Good understanding of each other’s nature. Could form strong bonds if they have areas of common interest. No clashes. Snake and HORSE: Some conflicts and confrontations. Have difficulty in seeing eye to eye. Unlikely to have much in common. Cold or distant relations. Snake and GOAT: Cordial and moderate relationship. Compatible to a reasonable extent. No underlying conflicts. Will combine efforts when feasible. Snake and MONKEY: Not very compatible. Cannot understand or communicate with each other. Clashes and conflicts if there is lack of trust or good will. Gains must be very large for them to cooperate. Snake and ROOSTER: Excellent match for marriage and business relations. 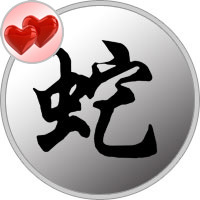 Can trust and understand each other very well. Highly compatible and successful team. Snake and DOG: Mutual respect and some area of common interest. No large conflicts. Compatible to a good degree. Will cooperate amicably. Snake and PIG: Cannot relate or understand each other. Deeply or lasting conflicts. Cannot bridge communication gaps or settle their differences amicably.